Well this was a helluva book. I was really excited to read an apocalypse/zombie tale from a romance writer and I was not disappointed. If there is such a thing, this is definitely a girl-friendly zombie story. 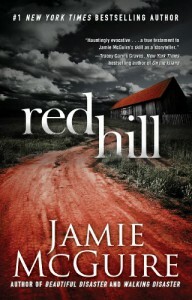 In Red Hill, a virus has broken out via flu shots and the infection escalates so quickly that you're into it by the second chapter...which is pretty typical of apocalypse stories. And I say 'stories' not books because I've only really read one another infection novel-The Passage by Justin Cronin. Other than that, I'm referencing movies. In truth I was a little more scared of the heroine, Scarlett by the end then the 'shufflers.' But I would be her in this same situation. And probably find myself as Zombie bait given the trouble she causes in the name of good. What I liked most about this book was that it wasn't horrific in the typical sense. The zombie gore is kept to a minimum. Rather, the damage inflicted is the emotional kind. I was on the edge of my seat a lot more in regards to the characters personal lives and as it turned out, that was a safe place to be. Though the violence is less, the global impact less terrifying and nightmare-inducing and the usual : 'Oh god what if one jumps out of the closet...?' not as all-encompassing, this book will upset and shake you. Once again (god I'm having bad luck with this lately!!!) I have to put my mummy-bonnet on and caution anyone over-sensitive to take a deep breath before reading this. There are some very upsetting themes in this book. Well, for me there was. Two scenes in particular had me cringing and you really can't get too attached to anyone because a lot of people die so sadly yes, it loses a star because I'm the HEA kinda girl. But there is a hopeful thread woven between the tragedies and I really couldn't turn pages fast enough! I was in a dressing room for my 4 year old's stage debut this afternoon hurrying through the last two chapters and crying out: 'No!' 'Oh yes!' 'NO!" And it's pretty hard to get an audible reaction out of me! Jamie McGuire has a real gift for building personal tension-whether it be worry, sexual pre-occupation, a crush or heartbreak, she gets it so right that you cannot help but become emotionally entangled with her books. I probably will read this again, and can't recommend it highly enough!